Co-creators Seth M. Peck (X-Men) and Jeremy Haun (THE BEAUTY), with colorist Nick Filardi and letterer Thomas Mauer, have launched a smash hit in THE REALM. 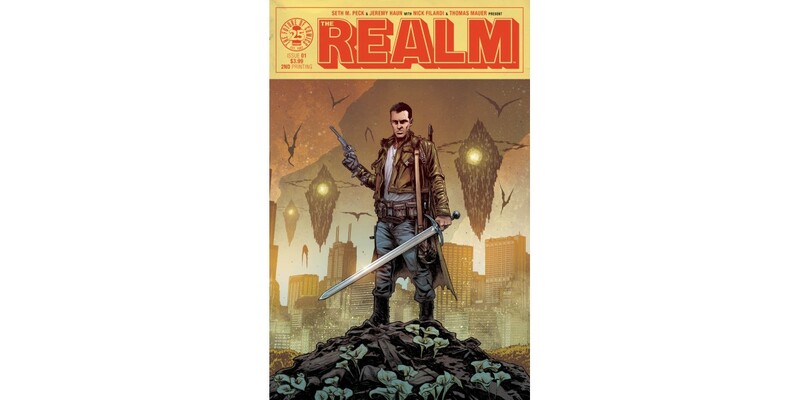 Image Comics is pleased to announce that THE REALM #1 is being rushed back to print on the same day as its release in order to keep up with overwhelming customer demand. Welcome to the treacherous world of THE REALM. Fifteen years ago, we were overrun by creatures of myth. The shadows hide nameless terrors—but not for long. THE REALM #1 will remain available for purchase across all digital platforms, including the Image Comics website (imagecomics.com), the official Image Comics iOS app, Comixology’s website (comixology.com), iOS, Android, and Google Play. THE REALM #1, 2nd printing (Diamond code: AUG178150), along with THE REALM #2 Cover A from Haun and Filardi (Diamond code: AUG170708) and Cover B from Jeff Lemire (Diamond code: AUG170709) will be available Wednesday, October 18th. The final order cutoff deadline for comics retailers is Monday, September 25th.